Doesn't track XP gained anymore. Edit: After restarting 2 times it works now and tracks XP properly. This was a bot-related bug, nothing to do with the script itself. anyone get banned yet from this? Does anyone know the rough cost per hour in runes? 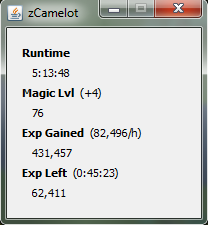 Haven't calculated it but you can try one teleport yourself, see how much EXP does it give and based on the EXP/hour you can find out. No idea to be honest, why don't you give it a try and let other people know?